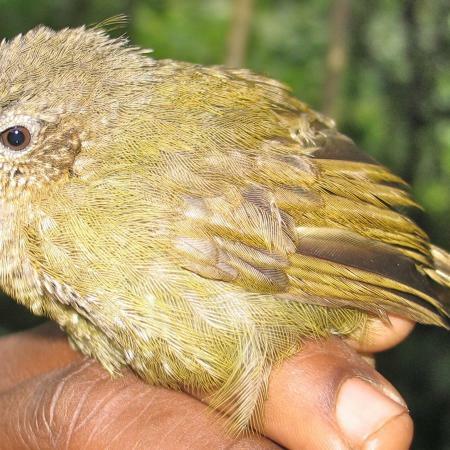 The parasitic worms of White-spotted Flufftail (Sarothrura pulchra) were the subject of a recent paper by African Birds collaborators. See the 22 June news item for more information. 23 July 2015: We've added several publications by our colleague Kazadi Minzangi of CRSN-Lwiro and his colleagues from around Africa and Europe. The papers are about the fatty acid contents in wild plants that are found in South Kivu (especially in Kahuzi-Biega National Park), DR Congo, where CRSN-Lwiro is located. These oils have health and medicinal uses; many are already used by the local population. Identifying such plants and their oil content can help promote a sustainable harvest that can help the local population economically and culturally and inform conservation measures in and around the park. You can find pdfs of the papers in the "Plant Publications" section of the Publications page. 6 July 2015: Former Field Museum and University of Chicago graduate student Lucinda Lawson (currently a postdoc at the University of Cincinnati), who wrote her dissertation on African frog evolution, recently published one of her chapters along with two herpetology colleagues and John Bates, her graduate adviser and a member of the African Birds team. The paper, published in BMC Evolutionary Biology, discusses the evolution of spiny-throated reed frogs (genus Hyperolius) in the Eastern Arc Mountains of Tanzania and includes the names of three previously undescribed species, the full descriptions of which are published here. 22 June 2015: African Birds collaborators have recently published two papers about avian parasites using samples collected on Field Museum expeditions to Africa. In one paper (Hildebrand et al. 2015), Vasyl Tkach and Eric Pulis, two of our colleagues who have accompanied the African Birds team in Africa, along with their colleague Joanna Hildebrand, "redescribed" an endoparasitic trematode flatworm from the gallbladder of White-spotted Flufftail (Sarothrura pulchra). 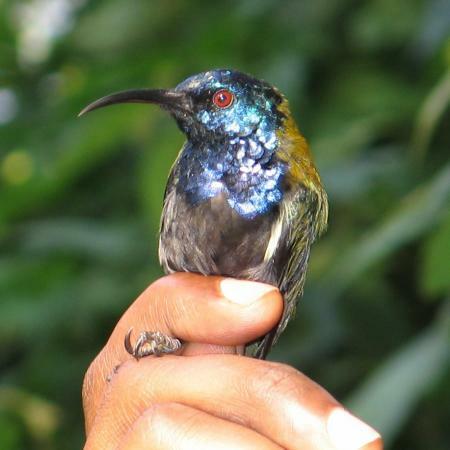 We caught the bird in Kibale National Park, Uganda, in 2013. The original description of the parasite, Lyperosomum sarothrurae, was incomplete, so the authors improved the description and included molecular data in assigning it to genus. The second paper (Klimov et al. 2015) is about ectoparasites, dust mites in particular, by a group of scientists from Russia and the University of Michigan. They studied the relationships of a group of mites using a multi-locus molecular phylogeny as well as a morphological analysis. Understanding the relationships of this group is particularly important because of its connection to human health--it includes the main genus of allergy-inducing mites. The paper used mites collected from three Field Museum specimens that were collected in 2009 in Malawi. Full citations for both papers can be found on the Publications page. 10 June 2015: We've added a recent publication by our colleagues at CRSN-Lwiro, comparing the plant diversity around the field station at Lwiro with two sites on Idjwi Island in Lake Kivu. Led by Melchi Kazadi Mizangi, the authors pay particular attention to oilseed bearing plants, which have potential economic value. The field work upon which this paper is based was done during the Macarthur Foundation-funded P-BEATRA training program, a collaboration between two Congolese research stations (CRSN-Lwiro and CRH-Uvira), the Congolese Institute for Nature Conservation (ICCN), and the Field Museum. This and many other publications can be found on our Publications page. 1 June 2015: Some of the genetic work we have done in recent years includes using microsatellites--repeated elements of DNA in the genome--to help understand population genetics of African birds. A group of scientists from Roosevelt University and the Field Museum recently published a short paper characterizing such loci in Buff-spotted Woodpecker (Campethera nivosa), a common woodpecker of lowland tropical forests across the central part of the continent. The study was part of the master's thesis of Nausheen Khan, whose adviser, Norbert Cordeiro, is a professor at Roosevelt and a research associate at the Field Museum. Other Field Museum participants on this project are research assistant Kellie Murdoch, birds collections manager Ben Marks, and Kevin Feldheim, manager of the Pritzker DNA Lab. 30 April 2015: A paper a long time in the making, we have recently published a study about haemosporidian blood parasites in bird samples collected on a 2009 Field Museum expedition to Malawi. The first author of the paper, published earlier this month in PLOS ONE, is Holly Lutz, who led a team of scientists from The Field Museum, the University of North Dakota, and Cornell University. A summary of the paper can be found on Josh Engel's blog and the entire paper is freely available at PLOS ONE. 13 March 2015: We just had a team of collaborators emerge from the forests of the Imatong Mountains in South Sudan, where they were studying birds and mammals of these poorly-known mountains. There are several subspecies of birds that are endemic here, and we look forward to examining their genetics to see how much they differ from other populations. As far as we know, the last time ornithologists visited these mountains was on a Field Museum expedition in 1977. 30 December 2014: We recently published a paper in Ornithological Observations, a wonderful online journal with a self-explanatory title that is produced by the Animal Demography Unit of the University of Cape Town and BirdLife South Africa. 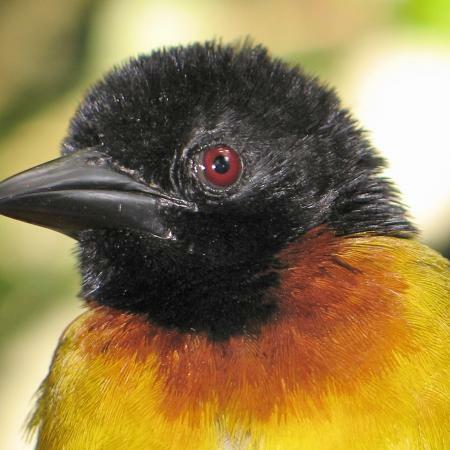 It's a great place to find short natural history related papers about African birds. The Field Museum's Josh Engel just had a paper published about observations of visible migration of birds that he made on museum expeditions to Congo and Uganda. You can find the paper here. 16 December 2014: The Field Museum's African programs have had a long and productive relationship with the Irene D. Pritzker Foundation, with a five-year grant from that foundation coming to an end with the end of the year. Funding from IDP has gone to a variety of projects in Africa and by African scientists and students, some of which we have featured here. They have highlighted this collaboration recently on their blog. We at African Birds hope for a continuing relationship with the IDP Foundation, especially since we've seen first-hand how this money has helped African students and scientists and furthered science and conservation in Africa. The Field Museum has a long history of ornithological research in Africa dating back to inventory work by collectors working for the museum and extensive field work by curators W. R. Boulton (West Africa and Angola) and Melvin Traylor (Zambia, Botswana, Egypt and Sudan). The museum also purchased important historical collections of F. J. Jackson and V. G. L. van Someren (Kenya and Uganda) and smaller collections made by Goode (Cameroon) and D. Parelius (Ivory Coast). Since 1990, we have worked in Central African Republic, Democratic Republic of Congo, Uganda, Rwanda, Burundi, Malawi, Mozambique, South Africa, and Madagascar. These efforts include collecting specimens, training and providing support to African graduate students and conservation specialists, and conducting scientific research useful for setting conservation priorities in the region. All of our recent work has been in concert with local institutions and colleagues. 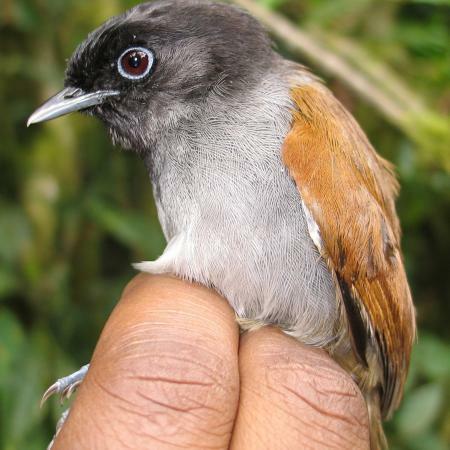 In Malawi, for example, we have worked with the National Museums of Malawi to make modern surveys of birds throughout the country to understand morphological and genetic diversity in both birds and their parasites/pathogens. This collection may be the most comprehensive modern collection of birds and parasites from any African country, something that will allow comparative work on Malawian birds to be conducted for generations to come. 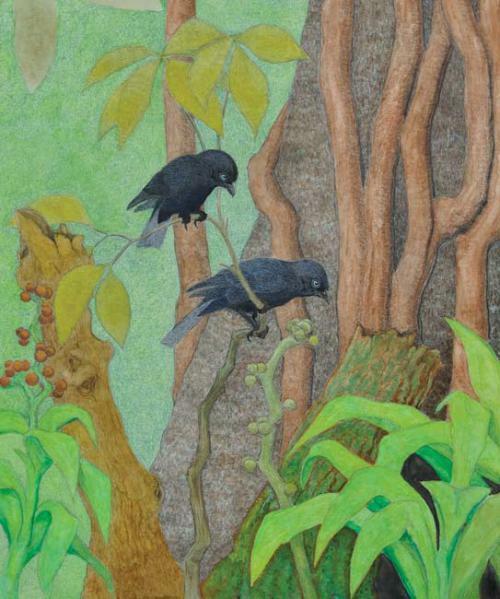 Painting of the newly described Willard’s Sooty Boubou (Laniarius willardi) by Thomas P. Gnoske that was the cover illustration of the July 2010 issue of The Auk.